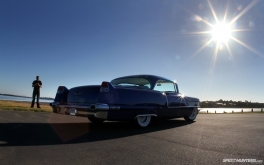 It’s not often I get nervous when I’m thrown the keys to someone else’s car, but then again the ’56 Cadillac I just buckled up in certainly isn’t your average ride – or at least the average when it comes to cars that I’m accustomed to driving. Piloting, or in this case ‘captaining’, a left-hand-drive car on the wrong side of the road it was designed to be driven on wasn’t the issue here. It was the shear size of the beast coupled with blunt brakes and steering best described as ‘vague’ that had me a little worried for its pristine panels and sparking chrome work. 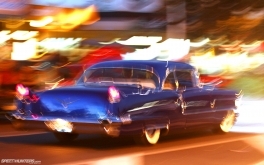 I soldiered on, pumping the gas pedal as I twisted on the key, awakening 400 cubic inches of Chevrolet V8 under the hood. It sounded grumpy. I liked it. 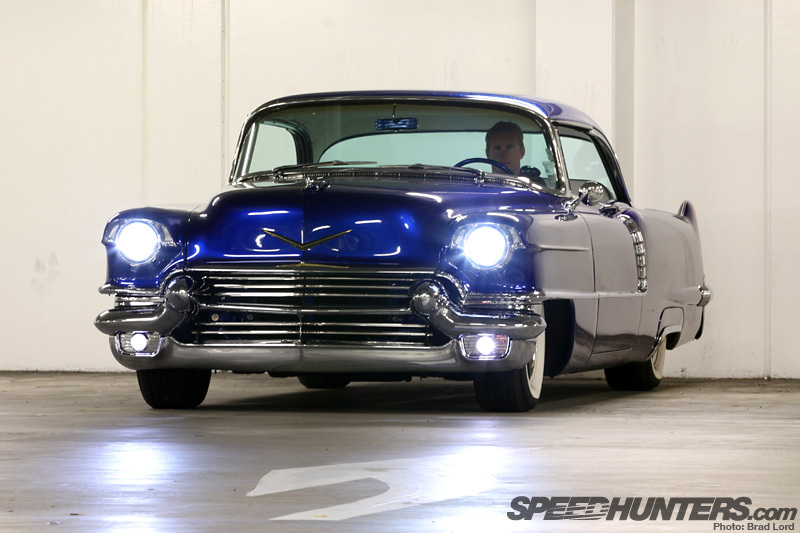 The ’56 belongs to Todd and Kym Wylie. I’ve know Todd for a long time when we both worked on NZ Performance Car and his automotive infatuation was a 1.8L (4G93) Mitsubishi Lancer GSR that had been extensively tuned to cut 11-second quarters. 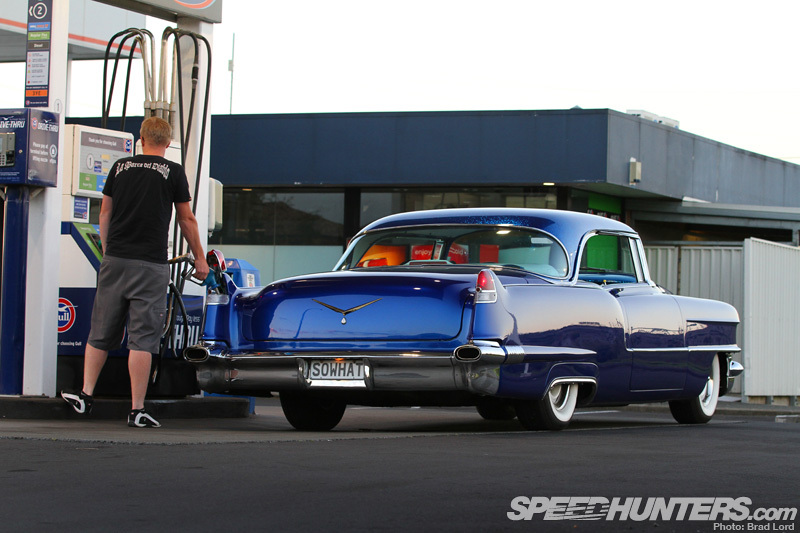 These days he heads up NZV8 magazine and – for the meantime at least – enjoys a slightly less frantic pace behind the wheel driving this ‘mild kustom’ creation. Five minutes into my drive and I think I was beginning to see the appeal. When Todd and Kym first got their hands on the Coupé back in 2009 it had been in dry storage for 15 years. The owner didn’t want to sell, but money eventually talked and the Cadillac was winched onto the back of a transporter and towed home. In a previous life it had spent the better part of four decades in Arizona, and it was there, in the desert, that its factory black paint had slowly succumbed to the elements and weathered to a beautiful bronze patina. 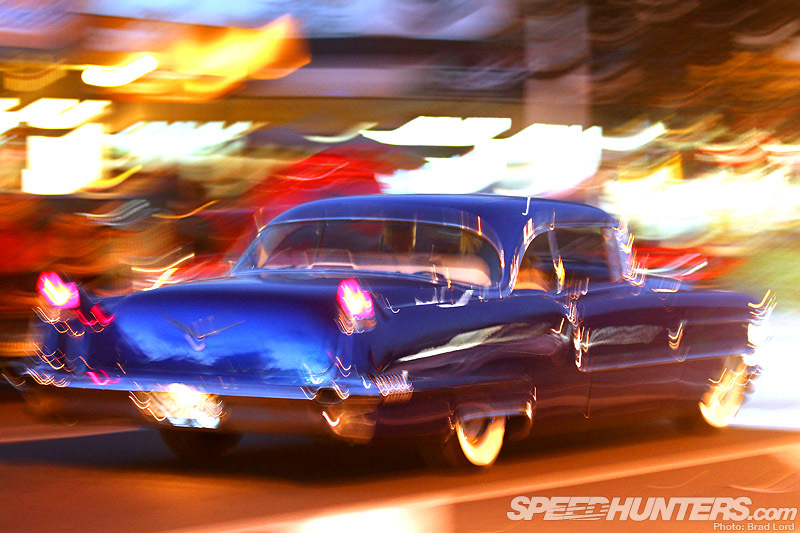 After getting the Coupé registered for the road – an intensive eight month project in itself, Todd tells me – the car was driven that way for a couple of years, clocking up thousands of road tripping and cruise miles in the process. 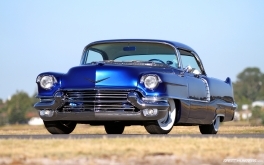 If original and unrestored cars are your thing, then you might be wondering why the Cadillac simply wasn’t left in that tarnished state that people pay good money to replicate, rather than the custom paint that adorns the acres of bodywork today. 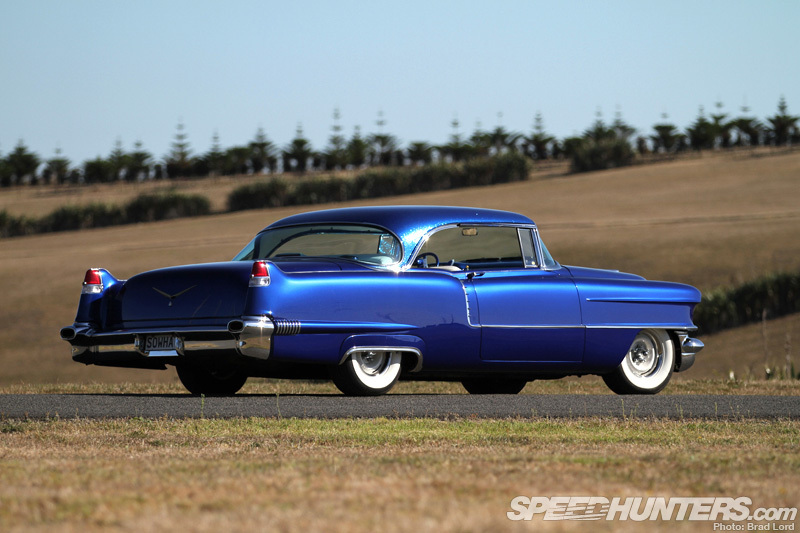 As much as they loved the way the patina looked and suited the car, New Zealand’s often humid and wet climate had started to take its toll, and the smooth bronzed metal started to become pitted. 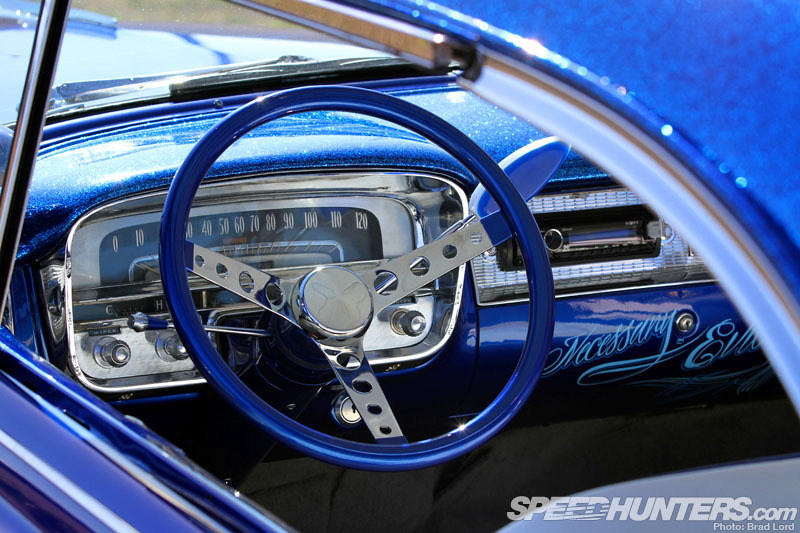 Restoration, as the hand-brushed Chaz Allen pinstripe on the dashboard reveals, was a ‘Necessary Evil’. 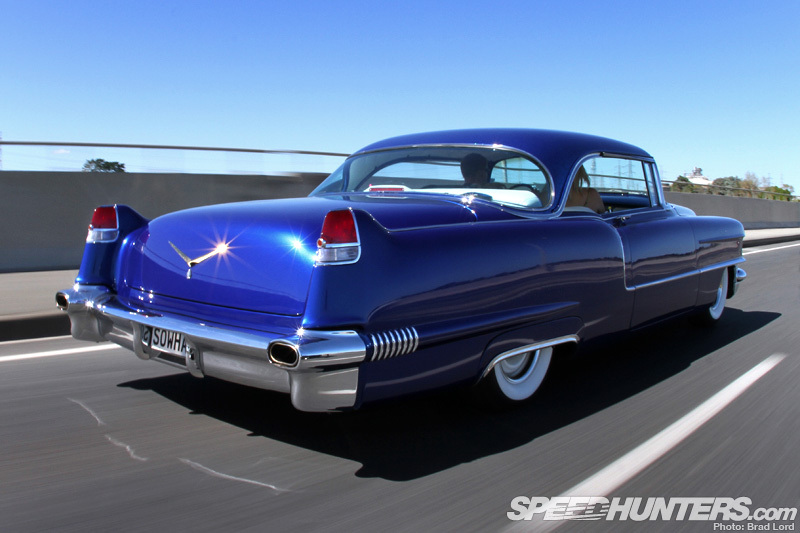 What followed was an intensive six month rebuild, and one that took the Cadillac all the way back to a bare body sitting on a stripped-down chassis. 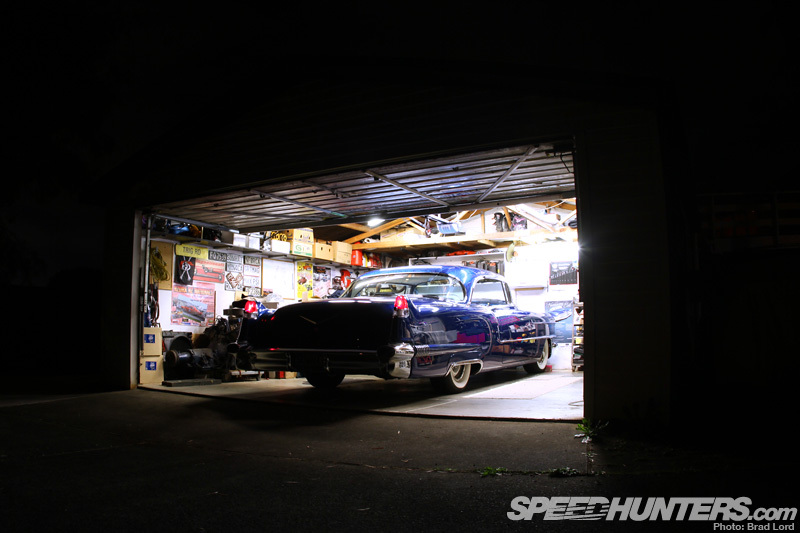 At one point 11 shops around the country had different pieces of the ’56 in their possession, and Todd says it was feat keeping the project logistically ticking along, let alone the many late night hours spent out in the garage with Kym where the majority of the car’s reinvention took place. 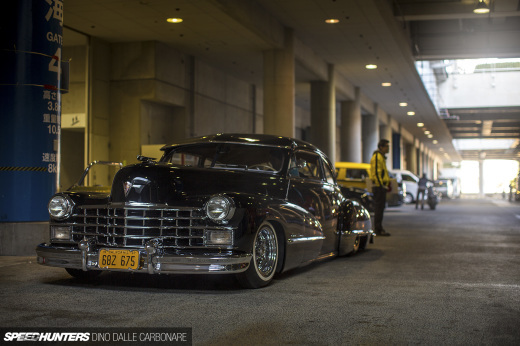 What made the job even tougher than your average was the physical dimension of the Cadi’. At six meters, or close to 20-feet in length, there was a lot of it to tend to. 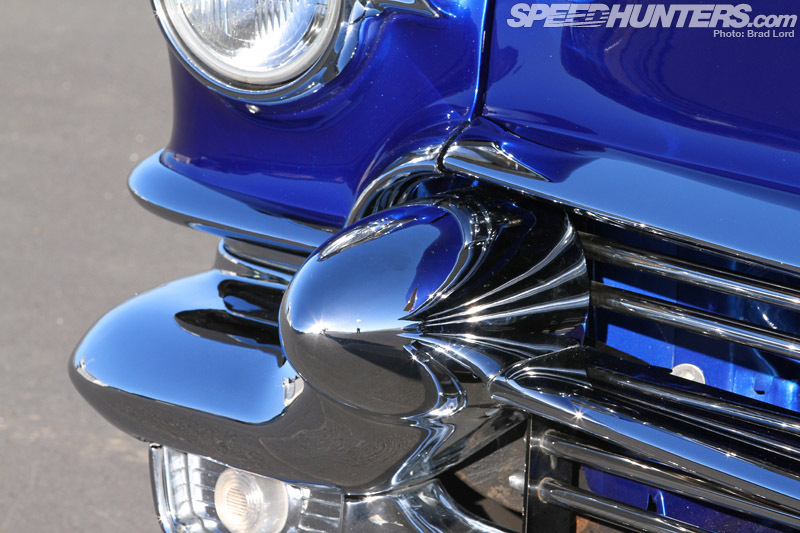 After the whole body was soda blasted back to bare metal and beat into shape, countless hours of paint prep ensued. In the case of the long panels where a perfect surface was required, blocking and sanding played out like a scratched record. 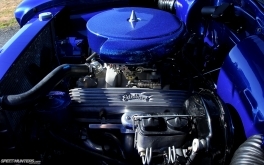 Only then were numerous coats of custom-mixed DuPont ‘Boogie Blue’ flowed on and over its dramatic factory lines by their painter, Andrew Town. 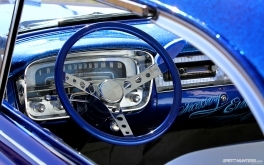 A flaked roof (and dashboard), an extension of the kustom theme, is set off by white-wall tires over powder-coated steel rims dressed in spider caps and a lot of re-chroming. It’s hard to not be impressed with the finished look, and judging by how much attention it was grabbing as we cruised from location to location, I wasn’t alone in thinking it. 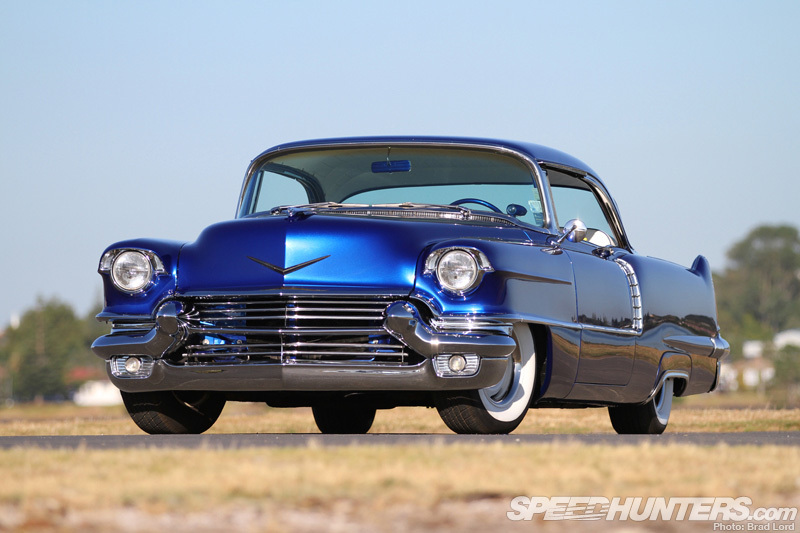 Long devoid of its original Cadillac V8, under the hood sits a 400ci Chev motor featuring a selection of hop-up parts like World Racing cylinder heads, a lumpy Kelford cam, a Holley carb on an Edelbrock manifold and Block Hugger headers running into a custom twin 2.5″ exhaust system. 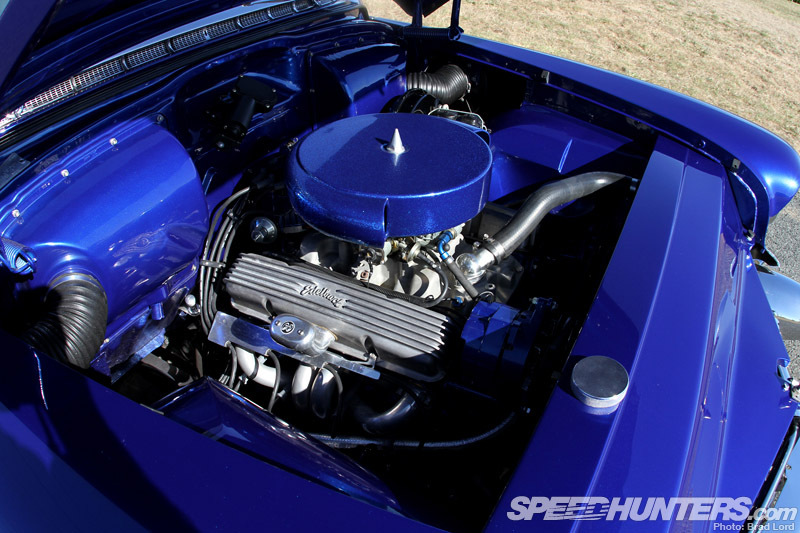 When Todd and Kym got their hands on the car the small block was running really rough and only managed to muster 70-horsepower at the wheels on the dyno. 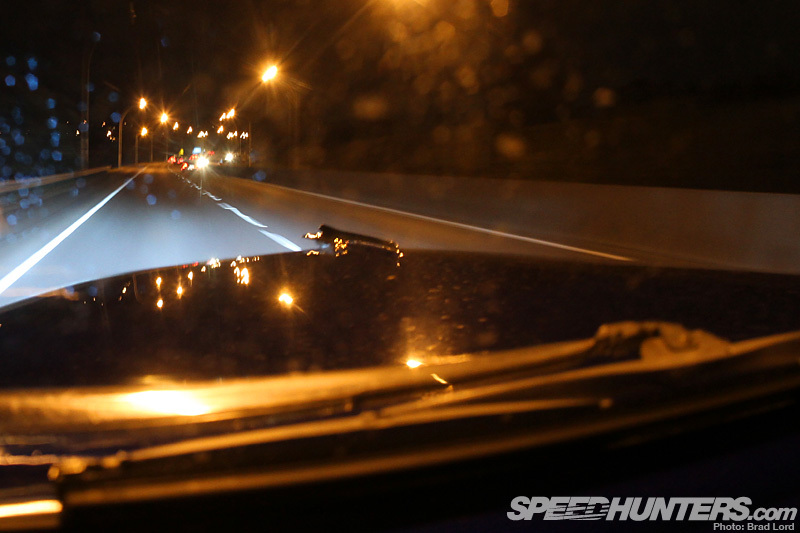 Tuning saw that number raised to 150whp, but only when the new cam and exhaust was fitted could 240whp be realized. For 6.6-liters of bent eight that’s not a big number by any stretch of the imagination, but from where I was sitting it’s more than enough to haul the 2.2-tonne chassis along quite pleasantly. While the engine was out getting cleaned up, the engine room got plenty of love. 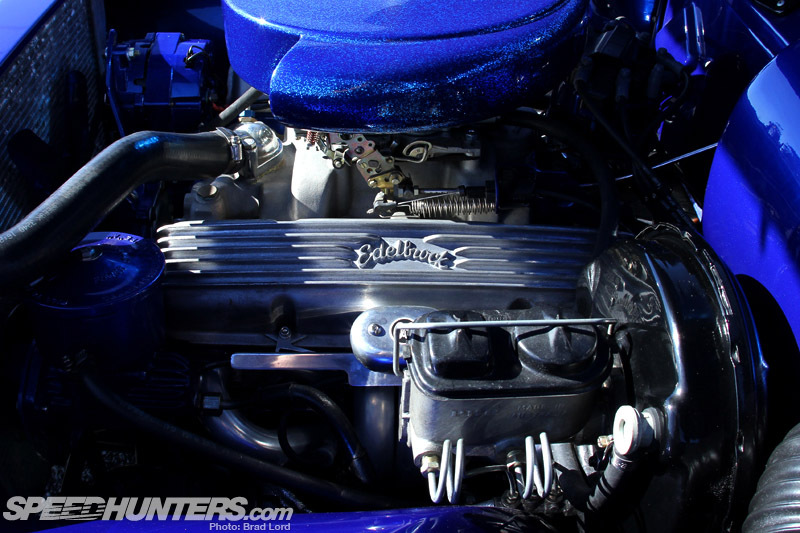 The metal radiator cover, which was designed expertly bent-up by local rod shop Bodymods, is a nice cosmetic addition. 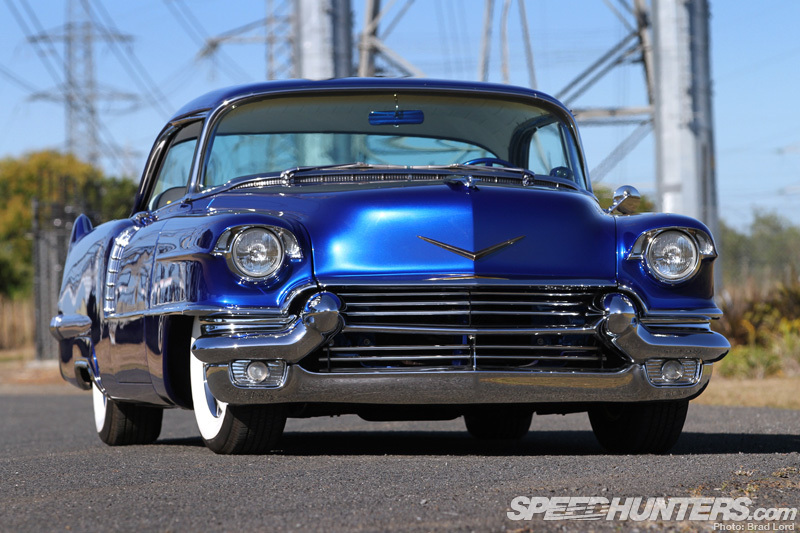 Although gruff at idle and noisy at all other times, the Chev set up is both reliable and useable – words that resonate throughout the entire build. 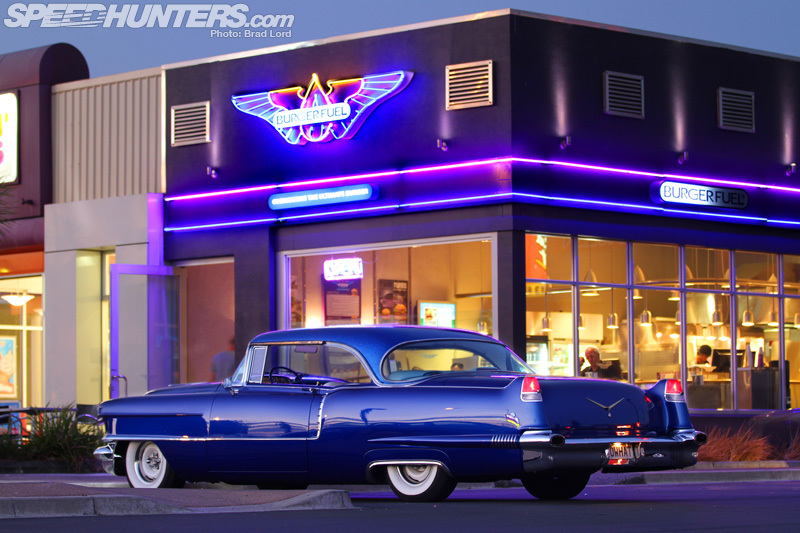 Ensuring that the Cadi’ was nice to drive was always high on the priority list, so the suspension was overhauled with Koni Classic dampers, and the brakes with Wilwood four-pots at the front and retro-fitted discs at the back. By no means are the handling characteristics perfect – and Todd still had some issues to deal to at the time of my drive – but from what he told me the difference between how it is now and what it was like then is like night and day. And that’s a good thing, because the car gets a lot of use. 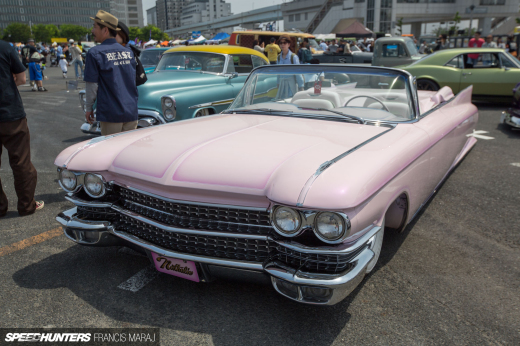 Inside, the Cadi’ was stripped totally bare and retro-fitted with Dynamat sound deadening and a complete tuck ’n’ roll retrim in leather and vinyl. 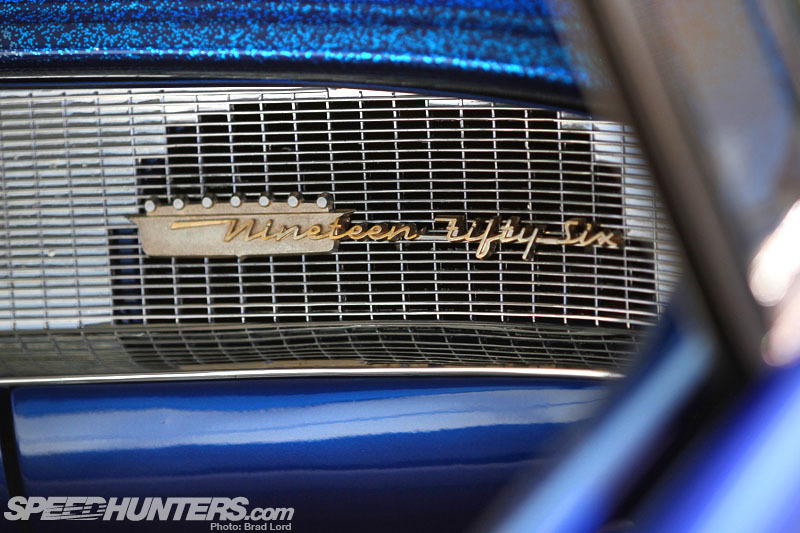 It’s a far cry from the original interior, where Todd tells me seat stuffing that turned to dust would erupt from tears in the upholstery whenever it was sat upon. 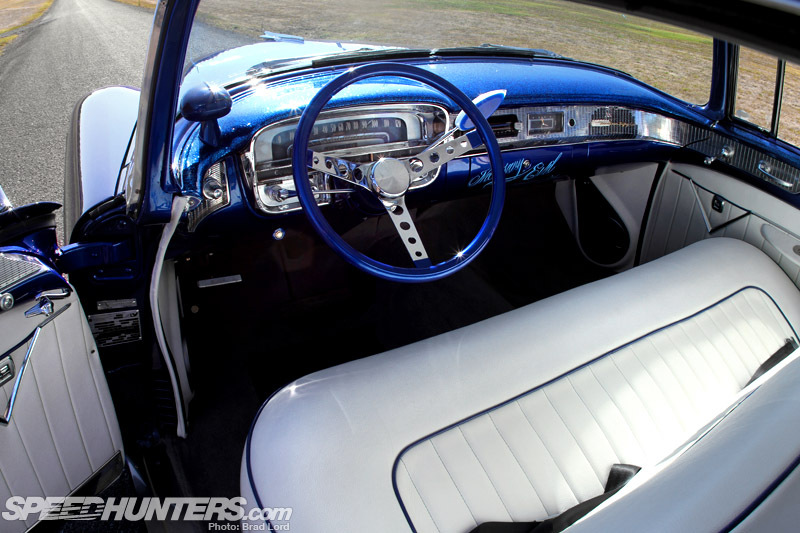 The interior includes a steering wheel, shifter and door lock knobs from Mooneyes, along with all the factory Cadillac trimming like electric windows, electric sliding front bench seat and the ‘Autronic-Eye’ headlight high-beam/low-beam switcher (that device atop the lefthand side of the dashboard). It all works, too. When the character of squeaks and rattles become too much on the long trips there’s a large audio system to wind up. 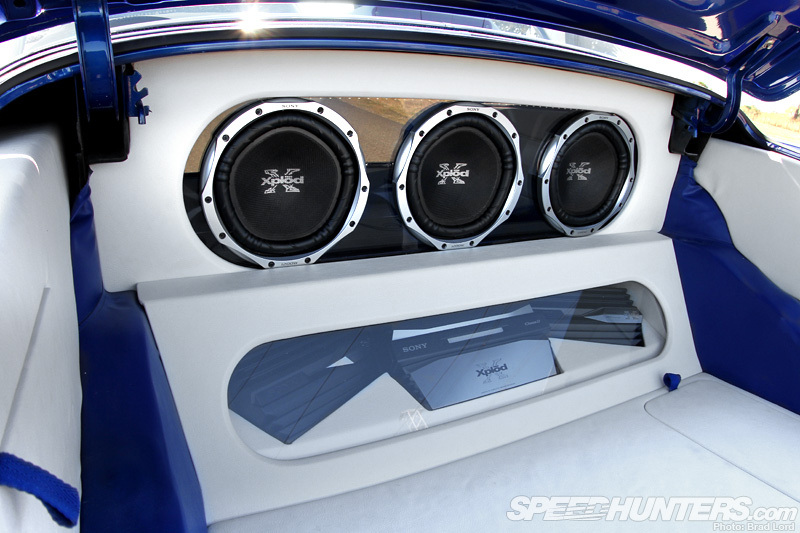 Filling the trunk – or partially filling the trunk as the case may be here, given the cavernous void – with a custom install might not be the traditional thing to do, but there was never any prerequisite to follow a script. The total sum of all its parts has created something quite special. 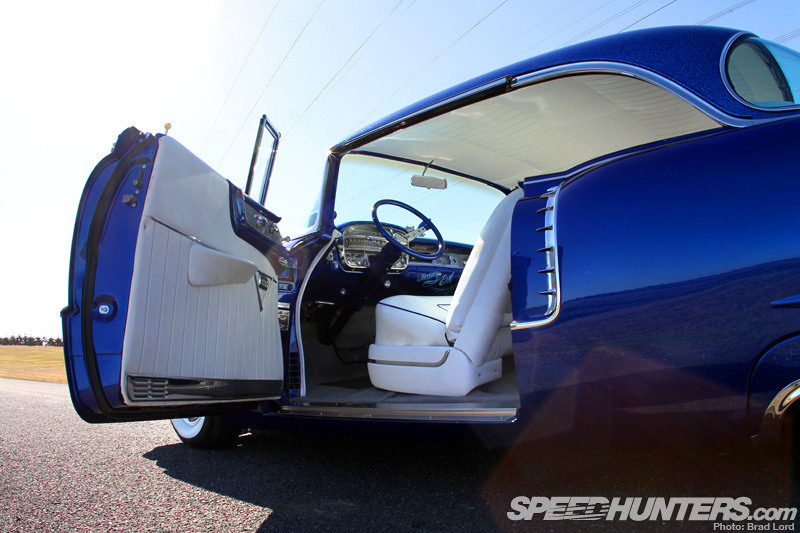 It’s certainly not the most modified kustoms in New Zealand, but execution is absolutely on par. 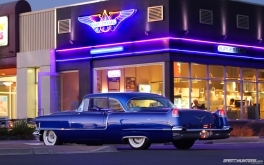 There’s a timeless appeal to machines like this, and even though cars like Todd and Kym’s ’56 are becoming older and rarer as the years roll on, there are more classic American cars – transcending all sub genres – on the road in New Zealand than there ever has been. A strong Kiwi dollar against the American greenback has a lot to do it of course, but for the most part it’s the the experience that driving a car like this affords. 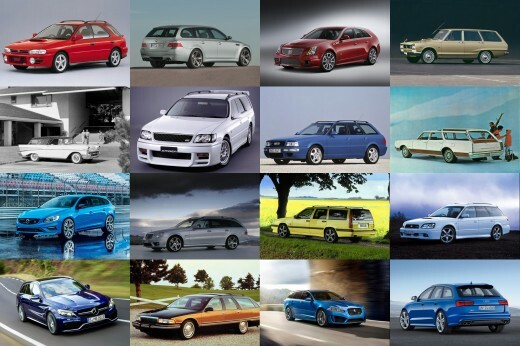 I don’t think I could ever see myself trading in my AE86 for slice of vintage American iron, but after my short stint behind the wheel of one I’d certainly consider making room in the garage in the future. In Todd and Kym’s case they’ve already made it – if only just. Given the Cadi’s length, the lining on the end wall of their garage had to be removed to allow enough room for the door to be closed behind it, and because of its width their DC5 Honda Integra Type R drive car is relegated to outdoors. 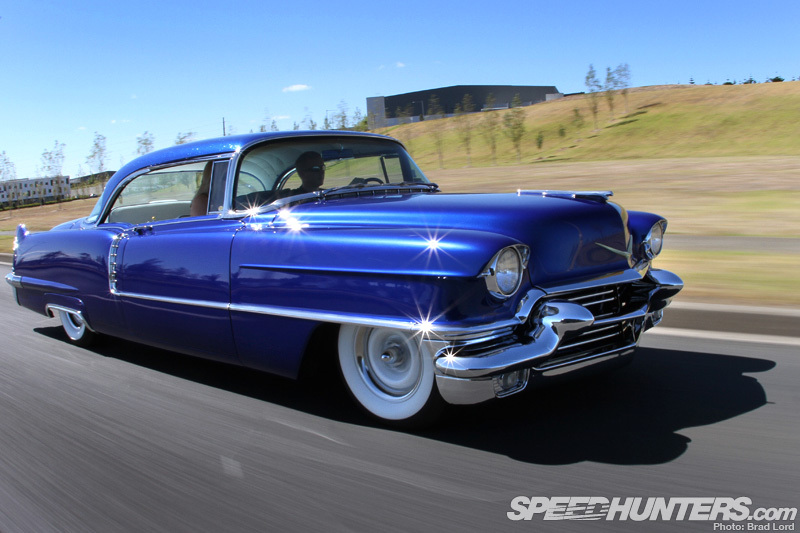 Collectively, Todd and Kym are always conjuring up new ideas when it comes to cars, and even though the Cadi’ build is still fresh, plans are already afoot for a couple of other American V8-based projects – both of which are about as far removed from each other, and this one, as possible. 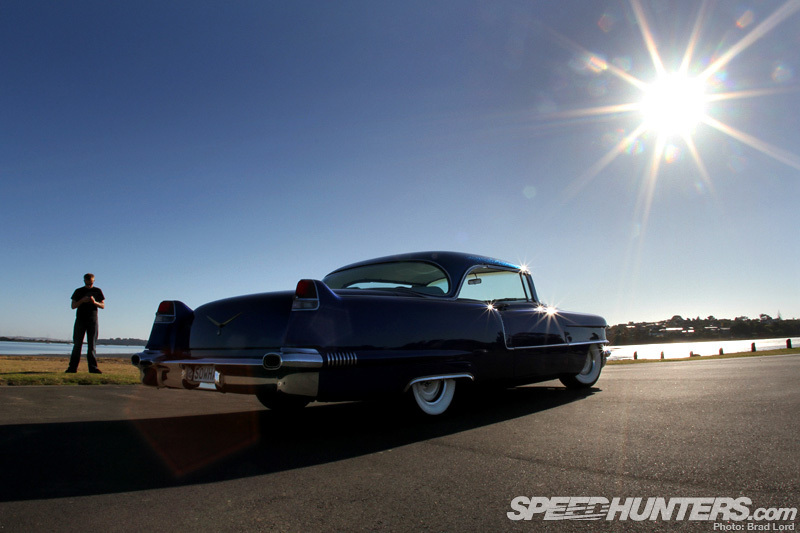 The ’56, however, won’t going anywhere, and I think I know why.